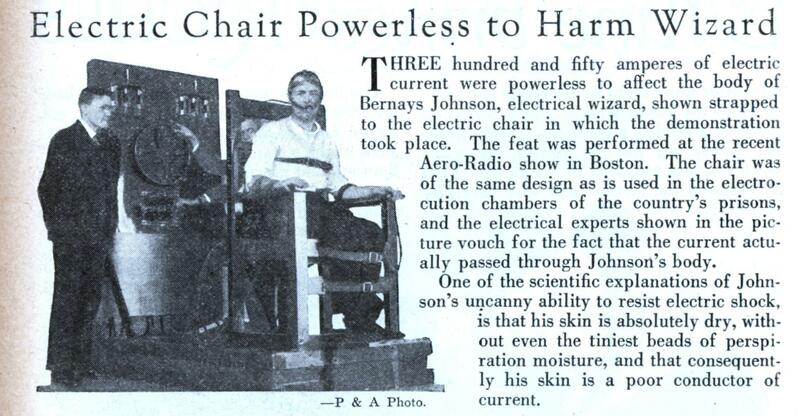 THREE hundred and fifty amperes of electric current were powerless to affect the body of Bernays Johnson, electrical wizard, shown strapped to the electric chair in which the demonstration took place. The feat was performed at the recent Aero-Radio show in Boston. The chair was of the same design as is used in the electrocution chambers of the country’s prisons, and the electrical experts shown in the picture vouch for the fact that the current actually passed through Johnson’s body. One of the scientific explanations of Johnson’s uncanny ability to resist electric shock, is that his skin is absolutely dry, without even the tiniest beads of perspiration moisture, and that consequently his skin is a poor conductor of current. Johnson was either (1) a good capacitor with the best of dielectic characteristics in an AC circuit, (2) Part of a magic stunt or (3) Wearing large gauge metal underwear. I don’t believe it. The article says 350 amps were used. Then it says the theory as to why he survived is because his skin is a poor conductor. But 350 amps through a poor conductor requires much more voltage and power than 350 amps through a good conductor, so his skin’s being a poor conductor would have actually made him less resistant to the problem. It would have arced and burned him, in addition to stopping his heart and causing problems with muscles and nerves. If a constant voltage source had been connected to his electrodes, then having insulating skin could have protected him. And it would have protected him by keeping the current very low, much much lower than 350 amps. I think the 350 amps are inaccurate. They probably meant “a voltage which would normally make 350 amps flow”. 350 amps would be _far_ more than what would kill a person. The skin thing seems to be the most probable. There is in fact the other case. People have been killed by a small battery when they applied the voltage under their skin. The skin really is a fairly bad conductor. Judging by his “performances”, he probably had a good understanding of electricity, and just knew how to wow an audience. docca: Good stuff. Thanks for the links. In the future however if your post doesn’t appear PLEASE wait for Charlie and his minions to restore it and don’t just repost it. Firebrand38: Sorry, my connection was shaky and I just thought it didn’t go through, since I got no confirmation message, just a blank form. Perhaps it could show a message like “Thanks, we will review your post soon” to give some feedback? Sorry again for the double post. Let’s see now… typical skin resistance=50,000 ohms so to get 350 amps the voltage would be 17.5 million volts. Did the article mention the 6.125 Gigawatt power source hidden in the wall. 6.5 Gegawatts and a DeLorean at 88 mph would get him back to the future . I.E He has low resistance electric underwear. They don’t say what the frequency was. The higher the frequency the greater the “skin effect” so less of the current actually passing through and more around. Having checked out the other article here about Mr. Johnson I would say he was using high frequency radio waves.